In 1998, the citizens of Davis first approved a $49 parks tax, which has been successfully renewed over the years. Measure H will renew this existing tax, allowing the City to continue to fund parks maintenance, including family parks, greenbelt maintenance, open space and habitat maintenance, tree planting and maintenance, recreational programs and facilities, and vandalism repair. This is the same tax rate the voters first approved twenty years ago, and has been renewed multiple times since. The current tax expires in June of 2018. This tax generates $1.4 million in annual revenue, used to offset parks maintenance costs. In 1998, this funding source generated 75% of park maintenance costs. Today it covers 18% of this cost, which is why small inflator is included (not to exceed 2% annually). Since 1998, we’ve seen total park acreage grow by one third. Meanwhile, for more than a decade, the state has been shifting a large share of our local property taxes away from our city. At the beginning of the last decade, the state returned about 27% of local property taxes to our city. Today, approximately 18% is returned. The state has shifted more than $3 million in property tax revenue away from our city. Our city has seen its share of fiscal uncertainty, but economic development efforts to generate revenue are underway, as well as continued efforts to prudently manage city costs. Think for a moment about the reasons you enjoy living in Davis. Surely, among them is our amazing parks and greenbelt system, and our many recreational opportunities, programs and services. Without Measure H, these essential civic and cultural amenities, along with other General Fund services, risk severe cutbacks. Please join us in voting Yes on Measure H.
Davis does not have a revenue problem in maintaining our beloved Parks. Davis has an employee spending problem! For far too long Davis voters have approved tax increases, ostensibly for maintaining critical City functions, only to see the new revenues instead go to increased employee compensation. In 2004, the voters approved a half cent sales tax increase after being told it was necessary to keep from laying off police and firefighters. Yet the very next year, all of that money and more was used to give employees the biggest pay increases in City history. Firefighters received a 36% increase over 4 years and our average firefighter total compensation is now over $206,000 annually! In 2012, voters approved a $49 parcel tax for Parks and then another half cent sales tax increase in 2016. Where did all that money go? Well, from 2012 to 2016 the average total salary and benefits for all full-time City employees increased over 25% from $99,849 to $124,954 (Source: TransparentCalifornia.org). Current average municipal employee salaries are now more than twice that of the private sector in Davis. “Work to accelerate the completion of a full staffing analysis to determine match between service delivery needs and staffing….This should save $1 million per year in employee costs”. Yet this simple study was never even done! We clearly cannot trust our City government to otherwise spend our hard-earned money wisely for the 20-year duration of this tax. Please vote “NO” on Measure H.
Davis is a nice place to live. We have good schools, nice parks, low crime rates and a friendly community. Measure I will raise funds specifically to repair and maintain our roads, sidewalks and bike paths. Independent experts have determined that we need to spend approximately $6 million to $8 million per year on an ongoing basis to properly maintain our roads, sidewalks and bike paths. Historically, the State of California and the Federal Government have provided local communities with substantial funding for road maintenance and repairs. 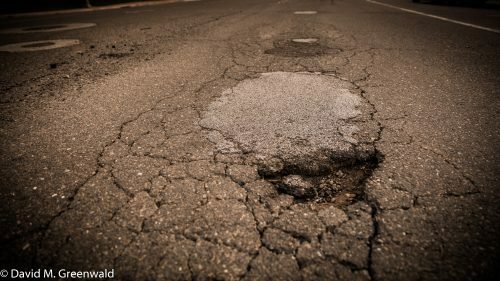 Over the past 15 years, State and Federal funding for local road repairs have diminished substantially. 15 years ago, Davis received nearly 4 million dollars a year from State and Federal sources to assist with road maintenance and repairs. Today we receive less than a ¼ of that. The City of Davis understands that it is responsible for providing good, well maintained roads and bike paths. As such, the City has begun using general fund money to help accomplish this. From just under $500,000 a few years ago to now over $3 million per year, the City has ramped up its own spending on roads. However, to close the gap between what we are spending and what we need to spend we need the community’s help. The additional funding that we receive due to the passage of Measure I will be spent in addition to the $3 million per year we are currently spending. Due to the long term cuts in Federal and State funding, we are asking the residents to approve a $99/year parcel tax. This will allow us to do a better job of fixing and repairing two of our most essential parts of our infrastructure – our roads and bike paths. The current budget for maintenance of all of these other infrastructure needs is an additional $4,550,000 annually. So the City is really only promising to continue spending $3,000,000 annually for road repavement but there is no guarantee they will continue to spend the additional $4,550,000 annually now budgeted for all of our other transportation infrastructure needs. Taxes present an interesting interface between those who hold traditionally conservative values and those who are further to the left on the political spectrum. Conservatives say that they believe in individual responsibility, yet they seem to believe that responsibility stops at their property line. They believe that the owner has total responsibility for maintenance or lack thereof on their own property and yet in my experience have been the first to complain when a neighbor does not maintain their property to an arbitrarily desired standard. With regard to city amenities that they claim to support, the anti tax group tends to abandon entirely the notion of responsibility to pay for what we, this time as a community, want. They frequently rely on two arguments. Either we are already taxed “enough” with no statement of what defines “enough”, the we need to be more frugal argument. Or they want someone else to pay for what we want, usually in the form of “we need to attract more business”, as though those businesses will not incur any costs to the community of their own. I am very, very far to the political left philosophically. And yet, I believe that as both individuals and as a community, we have the responsibility to pay for what we want. I want to maintain our parks, greenbelts, sidewalks and roadways. Needless to say I plan to join our current city council members in voting “yes” on Measures H & I.
I find this comment a bit odd. After all, one of the reasons it doesn’t have a revenue problem (which I might dispute) is that it receives $49 per parcel in taxes each year. If that money goes away, it most certainly will have a revenue problem – if it doesn’t have one already.